We recently had the pleasure of staying at South Beach Inn in Cocoa Beach, but it came about completely by accident! I always try to book our hotel stays through hotel.com because you get a free night after booking 10 rooms with them. Supposedly this makes me the "expert" on travel in the family. We arrived in Cocoa Beach ready to check into our hotel only to be told that I'd booked the room for the next month. To make matters worse they had no rooms available. No problem - I'll just jump back online...wrong! It's spring break in Florida and there are no rooms to be found. We decided to just drive by smaller hotels that don't use a large booking service like hotel.com. There weren't a lot of rooms to be found, but South Beach Inn had one! It is an older hotel, but it is very clean and well maintained. New owners took over recently and have added flat screen TV's and lots of cable channels. Not that you want to spend too much time inside when you're at the beach!. Warning! Do not go the the seasweptboutique.com webpage without first hiding your purse or wallet! You will not be able to stop yourself once you're on their website!!! 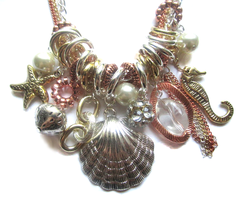 Click here to go to the seasweptboutique.com webpage!!! Warning - this is a pet friendly and smoker friendly hotel! The floors in the room are terrazzo - that's what makes it work. Our room was very clean and there was no smoke or pet odor! There is no pool (they are on the beach), and the beds are older. All in all, we were very happy with our stay. The owners and staff were great, and everyone staying there was very friendly! Below are pictures from our stay! A view toward the ocean down the front of the rooms. My wife really enjoyed the Adirondack chairs looking out at the beach. The gazebo was a nice touch. There's a gas grill and a charcoal grill available. Small living room with dinette. Notice the flat screen TV! From the living room to the kitchen. The kitchen saved us money, and kept us from having to keep going out to eat. This is the view from the bedroom to the front. The bedroom in the one bedroom units is semi-private, but there are 2 true bedrooms in the larger units. The bathroom is smaller - as you'd expect in an older hotel, but everything is very clean! A nice size deck over looking the ocean. A shower is available to rinse off after a dip in the ocean, and they even have kids beach toys available. Looking out toward the ocean from the deck. This is a view from the deck looking toward Cocoa Beach and Port Canaveral. A spectacular sunrise from the deck at the South Beach Inn. Night fishing! My son and I are always trying to drag something out of the ocean. Night fishing wasn't too fruitful, so we harassed the crab population! Click here to go to the South Beach Inn webpage! All One & Two Bedroom Units With Full, Fully-Equipped, Kitchens! Private Bedrooms With Fold-Out Living Room Queen Futons! 60+ Channel Cable TV! HBO & More! * Huge, Walk-In Closets! Free Local & Long Distance Calls! * Free Hi-Speed Internet! Guest Laundry! * Iron/Ironing Board! * Beach Toys! Huge Sundeck! * Gazebo With Grills! * Horseshoes! The Friendliest 24-Hour On Premise Staff In Cocoa Beach! Quiet, Secure, Location Just Minutes From All The Cocoa Beach Fun! Discounted Airport Pick-Up/Departure & Cruise Ship Service! Come Experience A True - "Surfer's Paradise!" Come Experience A True - "Vacation Getaway!" Come Experience A True - "Wedding You'll Treasure!" Come Experience A True - "Best Rates Guarantee!" Back to Top of South Beach Inn Page!